Rising American star DeAndre Yedlin made his first-team debut for Tottenham Hotspur on Saturday, coming on as a substitute at right back in the 79th minute of Spurs’ 1-0 loss to Aston Villa. The pacey and powerful Yedlin turned an impressive showing at last summer’s World Cup into a £2.5 million move to White Hart Lane last August, and his introduction on Saturday was no doubt an attempt to boost Spurs’ attack, which proved to be punchless for the second week running. 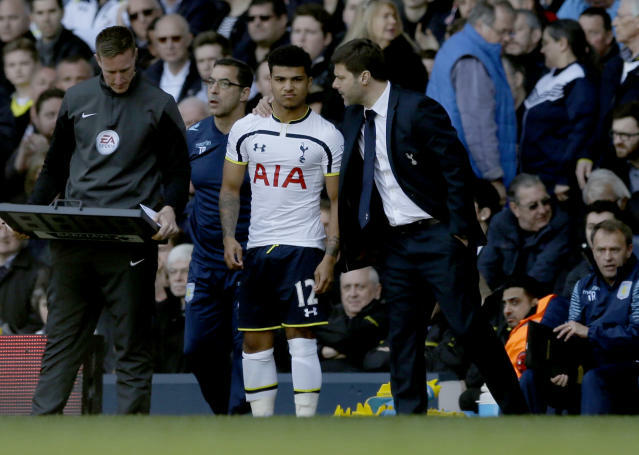 Yedlin had a couple notable moments in his limited involvement after replacing Romanian defender Vlad Chiricheș. He conceded a corner in the 83rd minute but in the process went shoulder-to-shoulder with Villa goalscorer Christian Benteke, who’s seven inches taller and 30 pounds heavier, and stood his ground in the encounter. Yedlin also kept his head during a late scrum after a hard foul against star teammate Harry Kane, although he did lose track of Villa’s Fabian Delph during a counterattack and was lucky Spurs keeper Michel Vorm bailed him out by deflecting the shot. It was Yedlin’s first league action of any kind since his last game with the Seattle Sounders on Nov. 30, when the Los Angeles Galaxy eliminated Seattle from the MLS Cup playoffs on away goals despite a Sounders victory. Yedlin joined Tottenham officially in early January and trained with the under-21 team until being included in the first-team squad on Saturday. Yedlin did make three appearances for the United States men’s national team in the meantime, playing a full 90 minutes against Chile in January while coming on as a sub in friendlies against Denmark and Switzerland in late March. USMNT head coach Jurgen Klinsmann has made no secret of his desire to see his players test themselves against the best by playing in Europe and pursuing opportunities in the world’s top leagues, and the Premier League certainly qualifies in that regard. Despite a perceived bias against American players in European soccer, Tottenham Hotspur has a history of giving Americans opportunities, even if some work out better than others. In any case, Yedlin must make the most of his opportunities in training and in games. Several Americans are already first-team regulars in the Premier League, including Brad Guzan at Aston Villa, Tim Howard at Everton and Geoff Cameron at Stoke City. Yedlin still faces competition, however, as first-choice Spurs defender Kyle Walker is expected to return soon from a foot injury. But if Yedlin, who’s still just 21 years old, can continue to improve defensively while retaining the physical traits that make him useful in the attack, we could see him featuring in the No. 12 shirt for Tottenham on a more regular basis.